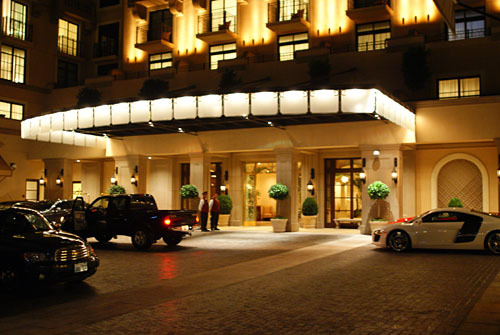 Muse at The Montage Beverly Hills, we hardly knew ye. Muse didn't even last a year. It was to be the premium dining room at the gleaming new Montage, a step up from the more casual (but still fancy) eatery Parq. The man in charge of both places was Executive Chef John Cuevas, who joined Montage Beverly Hills after a four-year stint as Chef de Cuisine of The Loft at the hotel's Orange County outpost. 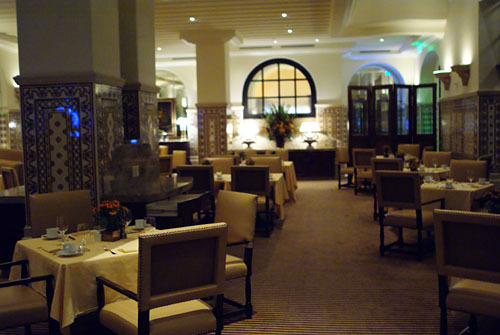 Before his tenure at The Loft, Cuevas helped open Studio, Montage Laguna Beach's signature restaurant (now helmed by Craig Strong, formerly of The Dining Room). The San Diego native's zest for cooking stemmed from his grandfather as well as his mother, who owned a small restaurant. Cuevas started out working the front-of-the-house at Loews Coronado Resort before moving to the kitchen, and afterwards, went on to receive his formal culinary education at Arizona's Scottsdale Culinary Institute. 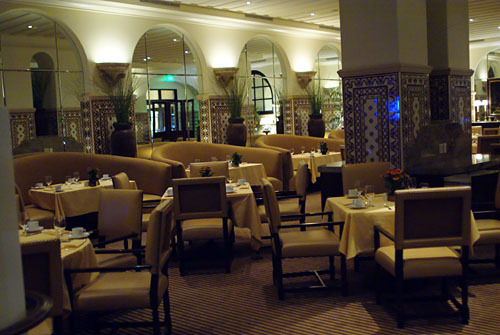 After graduation, Cuevas found himself at the well-regarded Mary Elaine's at The Phoenician, where he helped garner five-star ratings from both Mobil and the AAA. Southern California beckoned, however, and lured Cuevas back to Dana Point, where he worked at Motif restaurant at the St. Regis Monarch Beach resort (home to Stonehill Tavern). He began his career with The Montage shortly thereafter. 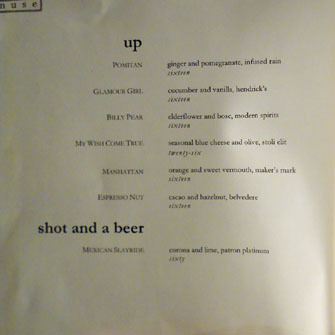 Cuevas clearly can cook, and created a menu of modern American fare for Muse, seasonal and simply-prepared, putting new twists on familiar elements. I don't think that the problem was with the food. 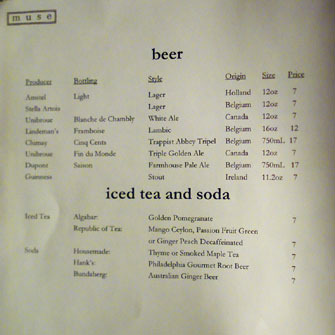 For starters, Muse had the grave misfortunate of opening on the same day as José Andrés' hotly-anticipated The Bazaar. Guess which one people went to? (hint: the one that rhymes with au revoir) Furthermore, I don't think that the restaurant's PR people did much to bring customers in, or to convince the Canon Drive dining crowd (Spago, Mastro's, Enoteca Drago, Wolfgang's) to eat at a new hotel restaurant. 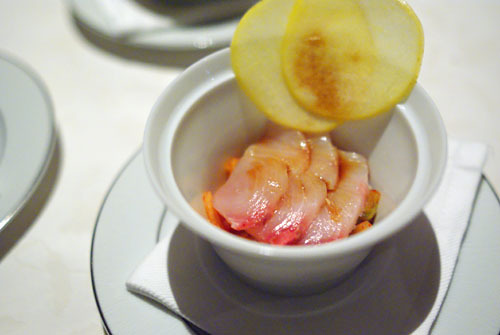 Muse was largely invisible, even in the eyes of the City's food cognoscenti. Whatever the cause, the end result is that Muse as we know it is no longer. We were told by the staff that Friday the 9th was their last day of service, and thus we were their last table, ever. From now on, the space will be used for large parties, an extension of Parq, so to speak. 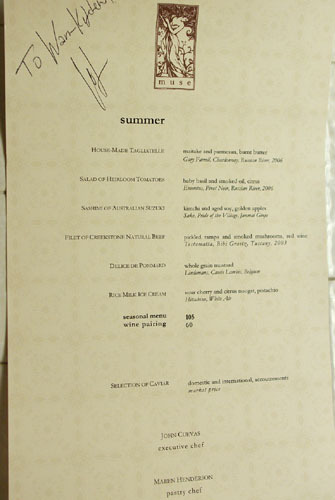 Muse's menu will disappear, though remnants may show up on the more casual restaurant's carte. The official reason for the closure was that business needs dictated that the space would be better suited for the large number of private events that the hotel hosts, but honestly I suspect that it was because bookings were down (...like the economy). 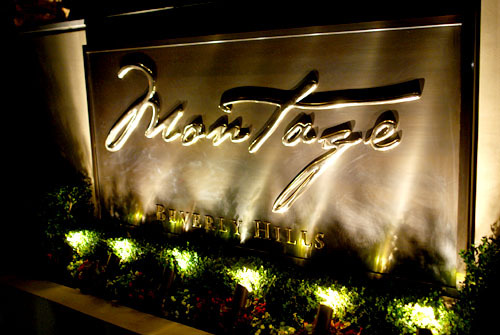 Muse is situated inside the new Montage Beverly Hills, a 201-room luxury hotel located in the heart of Beverly Hills. Parking is available on the street if you can find it, but valet somehow seems so much more appropriate (and is complementary with validation). Above, we see the intimate dining room, seating just 44 guests. The space is classic, refined, replete with oodles of dark mahogany, dimly lit, set off by crisp white linen. There's also a private dining room for 20, as well as an adjoining bar and balcony. 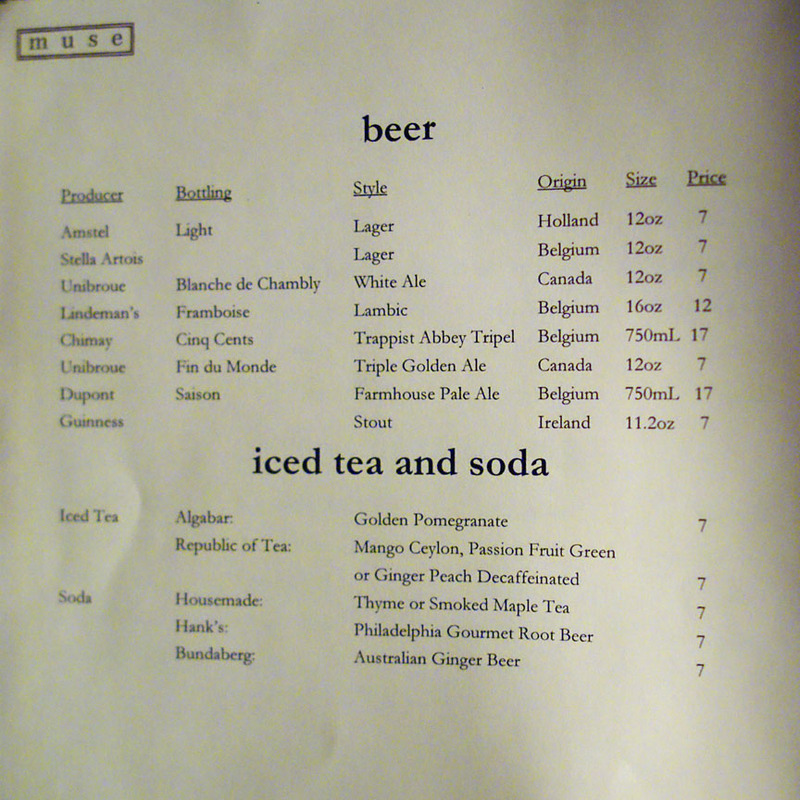 Upon being seated, we asked for the drink menu, shown above. Click for larger versions. 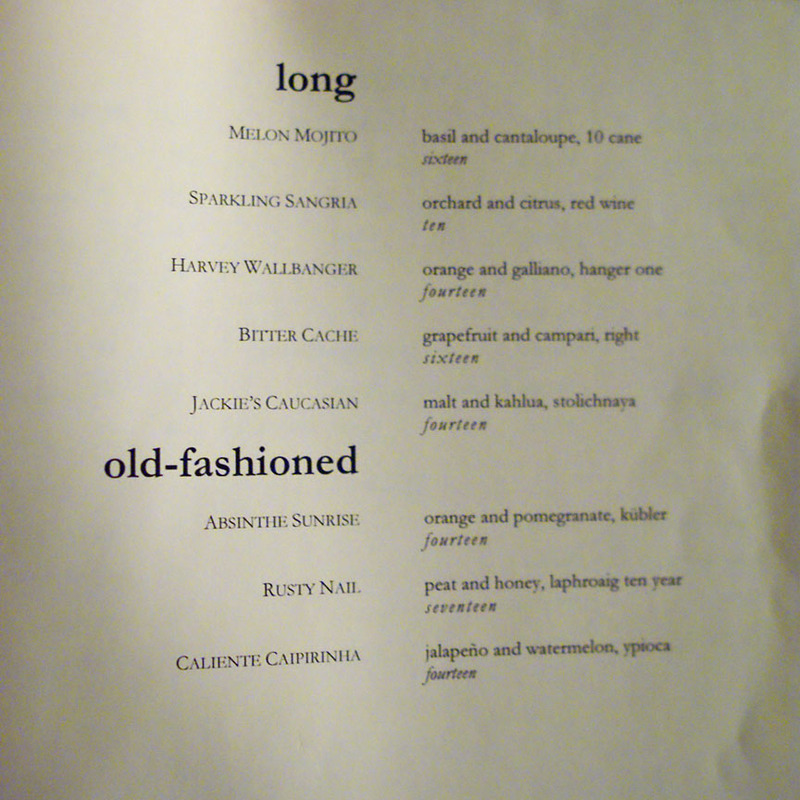 Interestingly, we ended up with three cocktails, all from the "old-fashioned" section of the list. 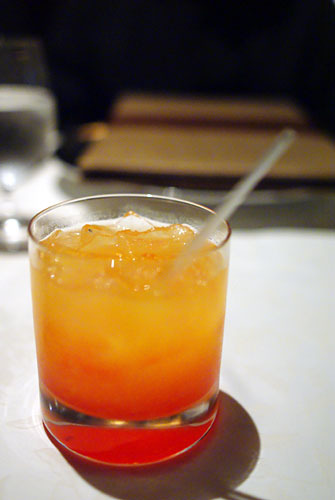 I went with the Absinthe Sunrise (orange and pomegranate, kübler) [$14], just because you don't see many cocktails with absinthe; think Tequila Sunrise, but with an herbal twang. 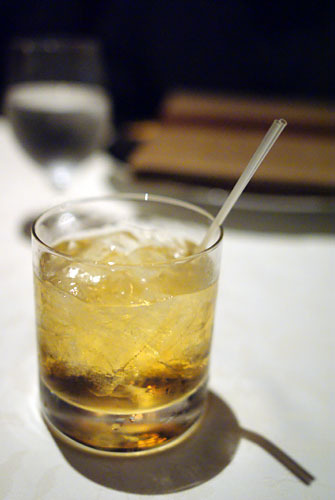 I also tried the Rusty Nail (peat and honey, laphroaig ten year) [$17], very hot and peaty with just a touch of sweetness from the honey, as well as the Caliente Caipirinha (jalapeño and watermelon, ypioca) [$14], sweet and sour with a bit of lingering spice. 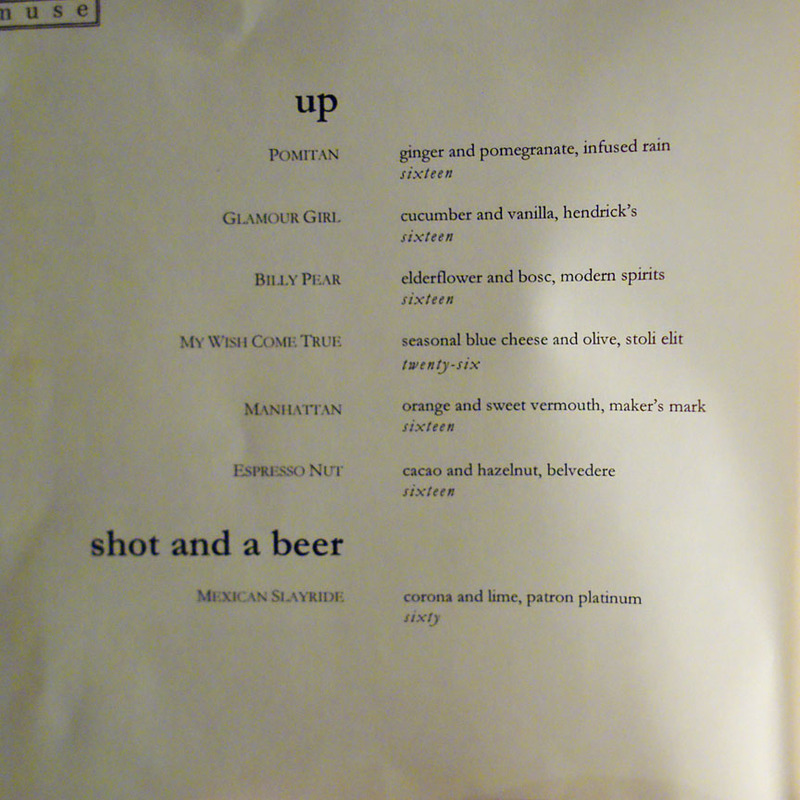 Muse's menu of "urbane American cuisine" is shown above; click for larger versions. We each went with the six-course Summer Seasonal Menu at $105, plus $60 for appropriate beverage pairings. Seasonal a la carte selections are also available, and we supplemented our tasting menus with six additional courses. We were provided a choice of three breads: a savory miche with caramelized onion and Pecorino, a mild milk bread, and a crispy lavash. 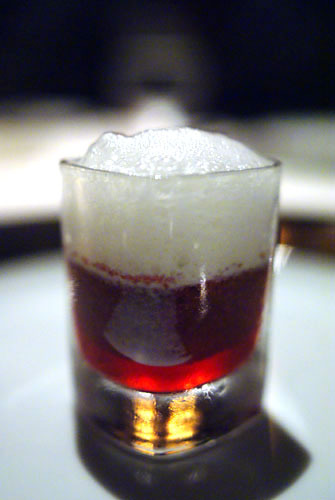 For an amuse, a shot glass of pineapple and blueberry soup came topped with a frothy cardamom foam. The aromatic smack of the herb was apparent on the attack, with the sugary fruit coming in later, leading to a long, saccharine finish. 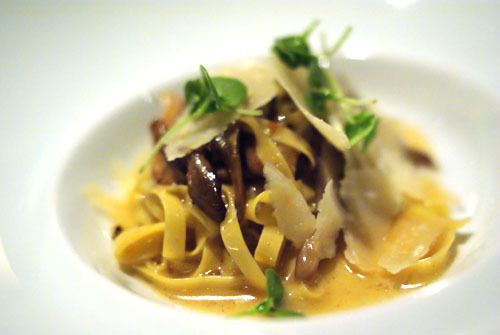 The pasta itself was tasty, though a bit plain, quite edible on its own but delicious with the mushrooms, which added just the right amount of weight, just the right amount of earthiness to the dish. 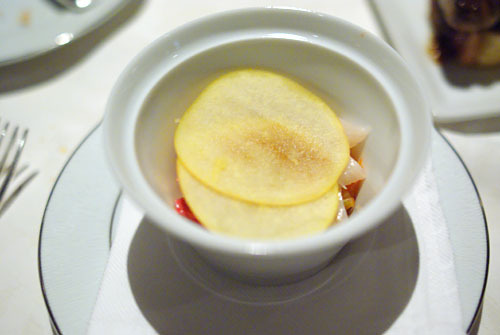 The cheese, meanwhile, did provide some tang of its own, but for me, it served as more of a textural element. Unfortunately, the mushrooms here weren't nearly as successful. 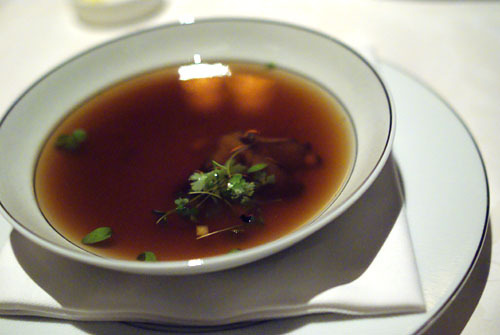 The consommé was light in body, and possessed a flavor rich in umami; we compared its sapor to that of ramen broth! Though four types of mushroom were used--portobello, porcini, chanterelle, lobster mushroom--their flavor seemed muddled and indistinct, leaving me unfulfilled. The pineapple was similarly invisible. 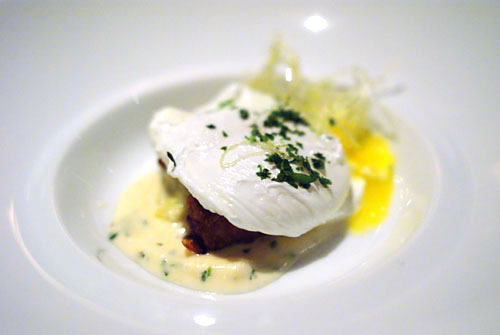 The ranch egg was a big bounce up from the weak consommé, and ended up as arguably my favorite course of the night. The egg was the star of the show for me, providing an enveloping creaminess that enrobed the rich, salty pork belly in its goodness, while the leek provided a vegetal counterbalance. One of my dining companions described this as "bacon and eggs," commenting on its breakfast-like flair. 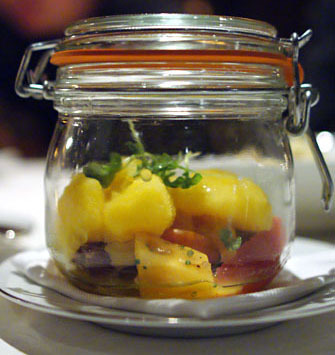 I loved the presentation of this dish, set in a canning jar; I don't think I've ever seen anything like it before. Fortunately, the contents of said jar were quite delectable as well. The tomatoes were some of the juiciest I've had, with a pleasing tanginess that went beautifully with the icy chunks of sweet citrus granita as well as the savory olive oil. 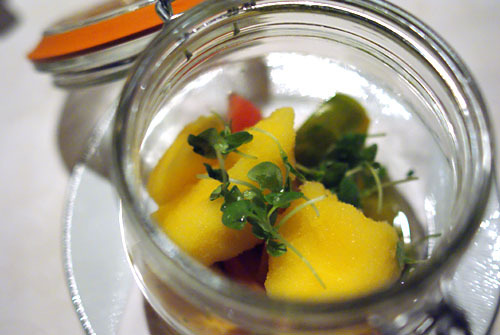 A clean, refreshing course with light, bright flavors. 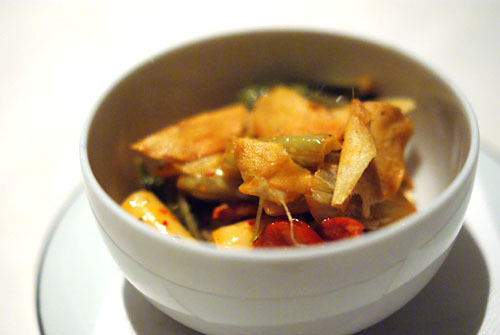 I'm used to having kimchi cool, so the lukewarm presentation here was an interesting change of pace. The temperature seemed to temper the tang of the fermented cabbage, but the kimchi was still plenty powerful to counter the mild, dense, chewy cylinders of rice noodle Though chorizo is strongly flavored in its own right, here it played second fiddle to the kimchi. Overall, quite good. 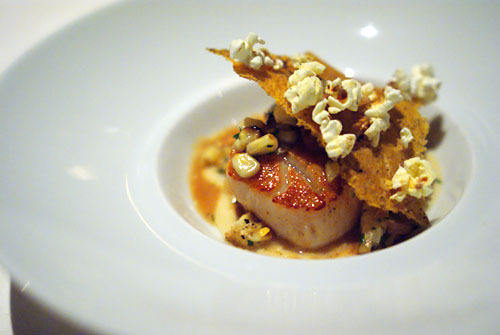 Next came a duet of perfectly cooked scallops, their subtly sweet/briny flavor accented by a superb sear. The bacon added a touch of salt to things, while the corn formed a surprisingly effective accession to the bivalve's natural sweetness. The popcorn and corn "paper," however, were there mostly for texture. Very nice. Suzuki translates roughly to "sea bass," and is a pretty rare species to be found, even at sushi restaurants. 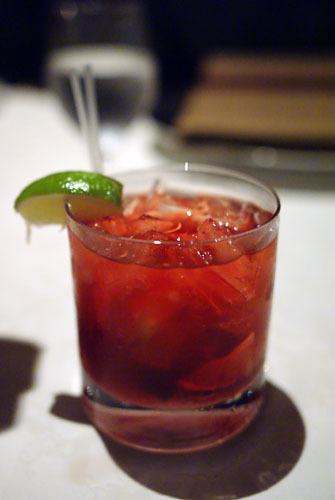 Here it had a firm, supple body and mild sapor that went marvelously with the bit of soy provided. Eaten with the kimchi however, the fish's flavor was dominated, turning the suzuki into more of a textural centerpiece, though this effect was somewhat tempered by the apple. A note about the sake: though the menu stated Pride of the Village, I believe we were actually served the Watari Bune Junmai Ginjo instead. 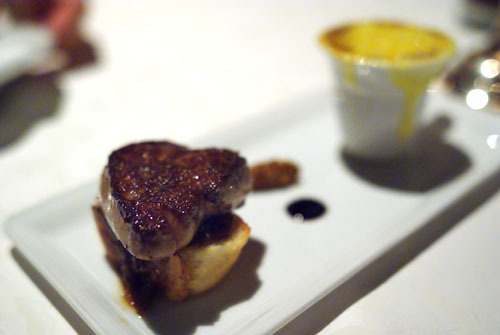 Regular readers will know that I usually take issue with seared foie gras being too sweet. Amazingly, the preparation here was actually too salty, too powerful for my tastes. Pairing it with the bread, thus, was a necessity. The soup, which one of my dining companions compared to "gravy," was similarly savory, and although tasty enough on its own, the pairing with the foie didn't quite click with me. 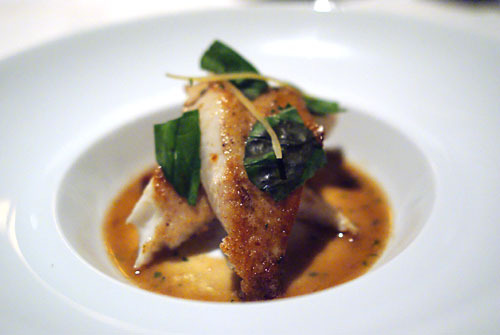 John Dory isn't a fish that I have too often. The example here was lean, flaky, firm yet pliant, with a mouthwatering, if somewhat blunt flavor, and beautifully crisp skin. I appreciated how the tanginess of lemon was used to moderate the fish. 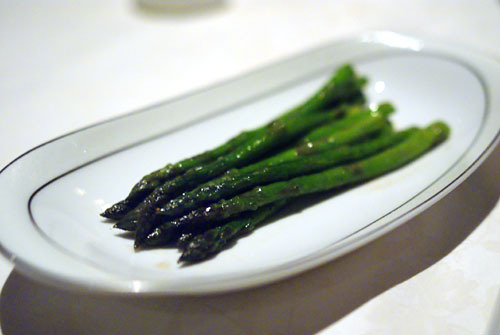 The Dory came with a plate of asparagus, which I thought was a bit odd, though I did enjoy the contrast provided by the vegetable's bitter smack. It's been a while since I've had a good filet mignon, so this was a nice change of pace. 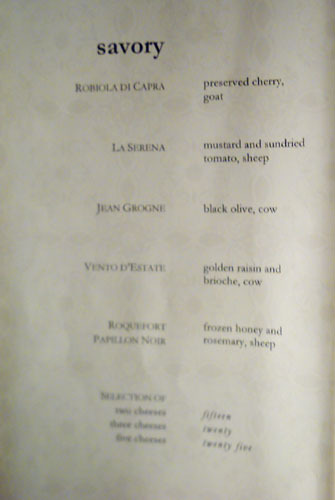 I was, however, surprised at the large portion (for a tasting menu). 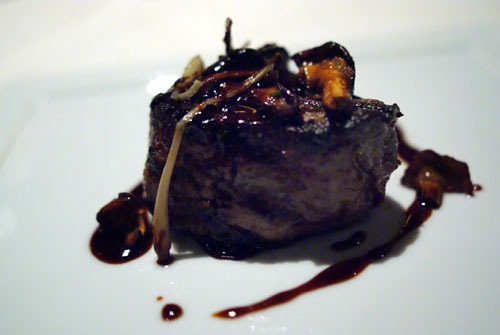 Cooked medium, it had a textbook tenderloin texture and a perfect char, not too fatty, but with good flavor. I actually preferred to eat the meat by itself, as I found the sauce a bit distracting. 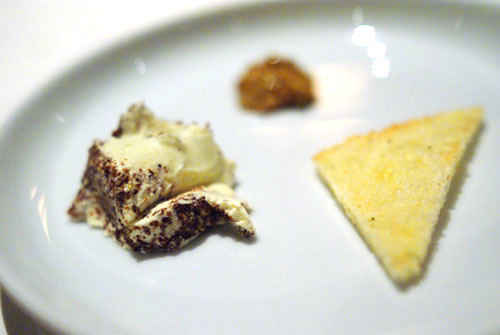 A fascinating fromage, the Delice comes from the village of Pommard in Burgundy. It is a soft, triple-crème, goat's milk cheese coated in mustard seed. 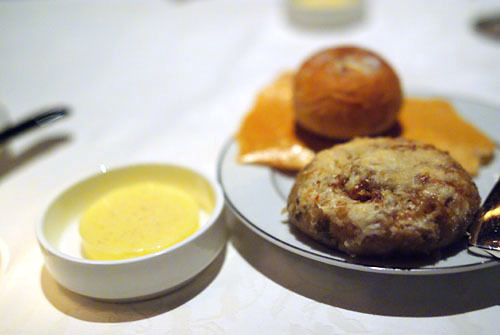 This gave it a delightfully tangy, spicy flavor that rendered the included mustard redundant. Oh the irony! This was one of the best desserts I've had in recent memory, and I forget to snap a picture of it; thanks to Ryan for providing the photo above. Think of this as an ice cream cake of sorts, one with gorgeous flavors of rice and vanilla, contrasted perfectly by the tart cherry, and accented beautifully by the nutty pistachio and sour nougat. Excellent. 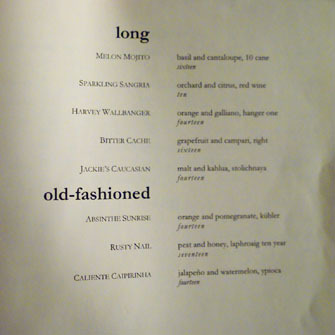 Not content to end here, we decided to augment our meal with a couple more creations from Pastry Chef Maren Henderson. Click for larger versions. 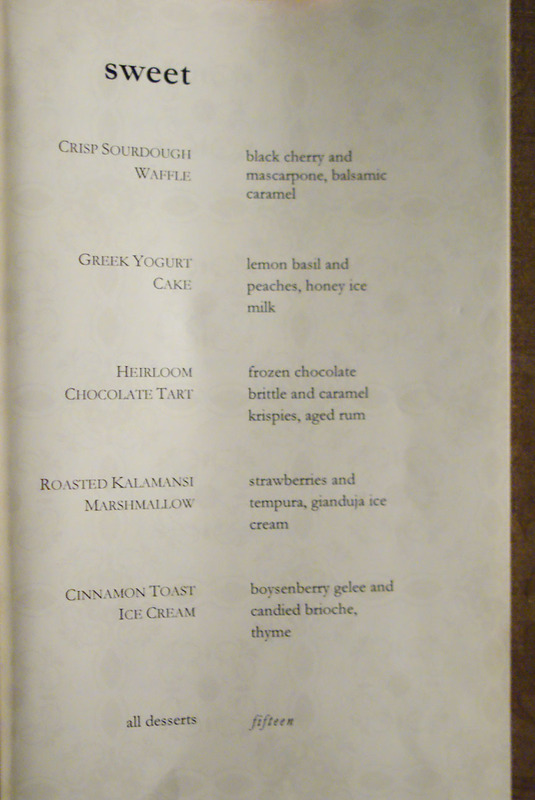 Quite simply, this was one of the best waffles I've ever had. 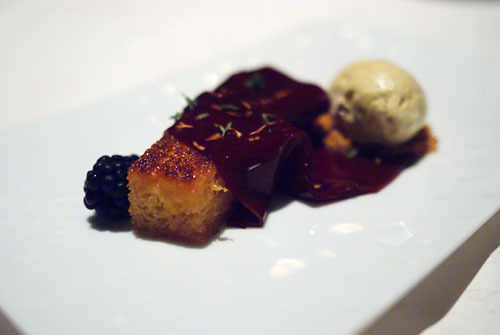 Perfectly constructed with a crisp exterior hiding a sweet, soft inside, its berry topping lent a tart flavor to the dessert that was deftly countered by the mascarpone and caramel--a superlative study in contrasting flavors, textures, and temperatures. When I saw this dessert on the menu, I instantly thought of my favorite cereal, Cinnamon Toast Crunch. And indeed, it did not disappoint. The ice cream really captured the essence of the cereal, and together with the finger of brioche, formed a superb combination of sweet and spicy. Meanwhile, the shawl of gelée draped over the brioche did an admirable job in balancing the cinnamon with its rich, jammy, boysenberry flavors. Quite good. 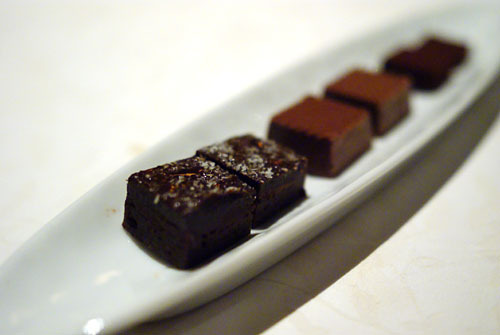 We finished with a plate of chocolates: caramel-coconut brownies, peanut butter crèmes, and housemade "Tootsie Rolls." Sadly, this was it, the last plate of food ever served by Muse. After chatting a bit with Sommelier Mark Hefter, we left Muse, and walked by the 88-seat Parq, an elegantly casual space serving three meals a day. 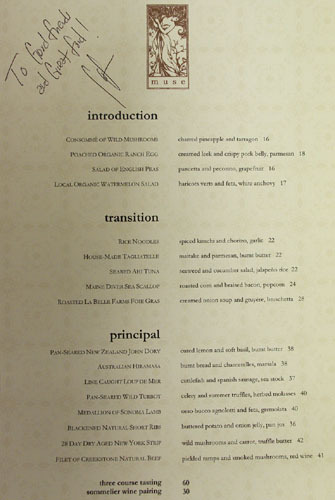 Really, though some of Muse's food will make it on the menu here, Parq is no replacement. So with that, we left Muse at The Montage sated and satisfied, happy from the good eats, but a bit saddened knowing that we'll never be able to come back. Muse just never got off to a good start, so in a way, its demise comes as no surprise. 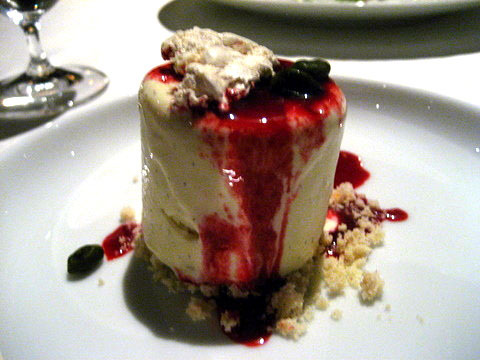 After returning home, I sent off a tip to Eater LA about Muse's closure, since it hadn't been reported anywhere else. I got back a thanks from editor Kat Odell, but there was nary a mention on the site--I think that about sums it up. Those desserts looked great. 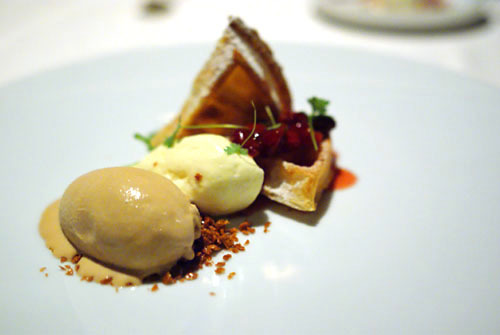 Do you know what is happening to the pastry chef Maren Henderson? love the Heirloom Tomatoes presentation! I can't even find a single Yelp review of the place. Talk about being under the radar! Josh: I'm not sure about Maren, but I imagine that she'll stay on at Parq? Jo: Me too. We need to see that more often lol. Jai: And only three comments here too! Wow, everything looks amazing. I currently work in Napa at a restaurant and would JUMP at the chance to work underneath such a pastry chef as Maren Henderson! Can you tell us which restaurant? Also, any idea where Henderson is now?